Would you like to receive Italian Recipes and Cooking Tips monthly directly into your mailbox? Meanwhile, put in a bowl all the dry ingredients: flour, sugar, baking powder, ginger and not too finely chopped almonds. Mix. Quickly whisk the eggs, add the milk and melted butter. Mix the liquid ingredients with the dry ones, leaving the compound quite grainy. 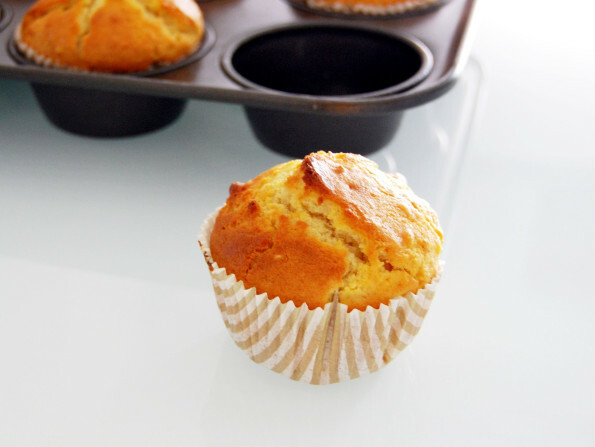 Put 12 muffin paper cups into a muffin mould (or butter and flour it). ¾ fill the moulds with the mixture and bake for 20 minutes. Leave to cool and serve. Try replacing the peeled almonds with unpeeled ones: you will have darker muffins with a stronger taste. For a touch of colour and different taste, add berries to the ingredients. These muffins are great with a cup of tea. Asti spumante DOCG, Moscato Provincia di Pavia or other sweet dessert wines. Create your own recipe-variations! For instance, you can add dried cranberries or raisins to the dough. There’s something magical about warm homemade muffins for breakfast! This particular recipe, which calls for almonds and ginger, will leave a breath-taking aroma in your kitchen. The nutty, sweet taste of almonds, together with the slightly hot and spicy note of the ginger, make a perfect combination. If you are a ginger-fan you can even add a couple of drops of its freshly extracted juice: just grate some ginger and squeeze it over the dough. Yum! Enjoy these dainties at breakfast time with a cappuccino or tea, or save it for an afternoon snack. Children will love it too!